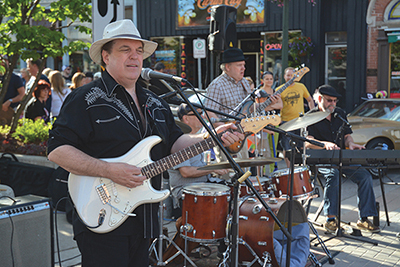 The now famous 16th annual Orangeville Blues and Jazz Festival is this weekend, running from Friday, June 1 to Sunday, June 3. As if to prove beyond doubt the benefit to the local economy of the arts, as many as 30,000 visitors come here to enjoy the almost all free concerts of some of the biggest names in blues and jazz. This year, award winners Sugaray Rayford, Robi Botos, Raoul and the Big Time, Kelly Lee Evans and Alex Cuba are among the 80 acts the festival brings to town. Those 30,000 visitors do not pay admission to get into town but they spend their money locally and discover this very special place. There are tickets to two venues: the Main Stage and the Opera House for a single price of $5. So we were lucky to catch the festival’s founder, Larry Kurtz, for a conversation. About the money: “A very small group of people fund-raise. We have sponsorship and government grants. Gary Brown is the one writing for grants and he’s successful but they’re not easy. They’re 70-page documents – hours and hours, putting together all the information surveys from visitors and reporting back to the government. They require lots of information. we only make a really small percentage of our income from vendors or admission. About who is playing: “We actually have 70 per cent of our performers who are local. That wasn’t in my mind when I started but I soon realized that we have so much talent – just because they’re local doesn’t mean they’re less talented. The festival is one of the places they can be showcased to a wider audience – new people in the area don’t really know the scene. “I think people know they may not know the musicians but they know they are going to be good. “From outside, we’re very well known in the Canada Blues theme. – I hear a lot of great feedback. The Toronto Blues Society umbrella for the blues music in Canada. Two years ago I got an award for the Blues Booster. In many this is the hardest part of the work for Mr Kurtz.